In about 2 – 3 weeks we will start to transition your lawns for Summer, we start once the temperatures at night have consistently been at least 65 degrees. You may be starting to notice your grass changing color; your grass does this because the winter grass (Rye grass) is wilting from the temperature change. If you do see signs of the color change please do not panic and most importantly do not start “over watering” your lawn. If you start to over water your lawn because it is starting to look brown you will make it harder to transition back to your Summer grass (Bermuda). Once we have started the transition you will notice slight changes to your lawn maintenance. 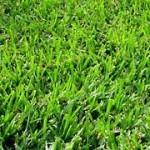 We will start by cutting your grass down so that only about 1/3 of the leaf blade is left. We will rake out all the dead grass and debris from the lawn. By removing the dead grass we will make sure that the sunlight reaches deep into the soil to absorb the nutrients. The warm temperatures and the sunlight are key in making the transition smooth and effective. After we fertilize your lawn we will change the water schedule. The grass will be watered twice a week for about 15-20 minutes. By adding more water it will encourage your lawn to grow again. 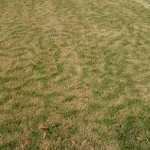 Once your lawn has begun to sprout we will apply ironite to help it green up. You can have beautiful landscape even in the desert. The first, method of landscaping in the desert is to choose plants that are native to the area in which you are landscaping, in this case Arizona. Second, the plants will not need expensive fertilizers to grow to their full potential. They are made to grow in the dry desert soil, these plants know how to survive with minimal amounts of water. 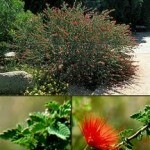 Listed below are excellent plant choices for desert landscapes. 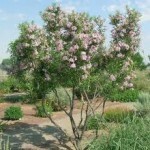 The Desert Willow has pink and purple flowers usually attracting humming birds. This tree does well in full sun and in dry soils. Surprisingly despite its name it’s not actually a willow tree. 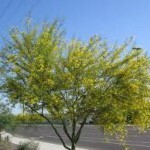 The Desert Museum Palo Verde is a thorn less tree with bright yellow flowers. This tree flowers in the Spring and is best in full sun. 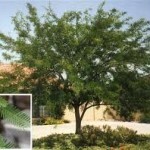 The Chilean Mesquite has greenish yellow flowers. The tree flowers in the Spring and Summer and is dormant in the Winter months. 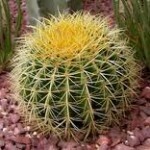 The Golden Barrel cactus has spines or sharp edges; use extreme caution when handling. This cactus blooms in mid-summer with a pale yellow flower. It is also Drought-tolerant and does well in full sun. 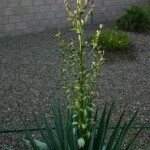 The Yucca Pendula is a cactus that does great in full sun or partial shade. This Yucca can be identified by its blue-green leathery textures foliage. It also has whitish flowers and blooms in the late summer to mid-fall. 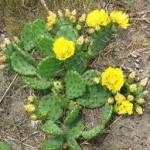 The Prickly Pear has flat rounded cladodes with yellow flowers. The cactus blooms in the Sprint to the early Summer and does great in full sun. The colorful fruit that grows on the cacti attracts birds in the summer months. The Baja Fairy Duster does great in full sun and flowers year round. The flowers are Scarlet Red to Orange-Red attracting humming birds. The Desert Ruellia is a plant native to Mexico. 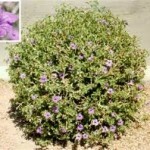 The Desert Ruellia does good in full sun and has funnel-shaped purple or blue flowers. This plant blooms in mid-March to November. The Mexican Honeysuckle does great in full sun and attracts humming birds. 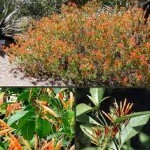 Clusters of bright orange, narrowly tubular flowers appear almost year round. Green ServPro LLC prides itself in providing you landscape maintenance and lawn care services as if it was our own. We not only promise to keep your home and garden landscape clean and green, but we guarantee we will perform the landscape maintenance the way you like it! We understand that every customer may have different tastes and preferences from the way we trim the shrubs to what type and color of flowers you like. Right from the start our Goal is to structure a lawn care and landscape maintenance plan to enhance or return your lawn and landscape to a healthy, green and clean appearance. Relax and let us take care of the dirty work! Contact us today via e-mail – We will contact you within 24 hrs. to set up your free estimate! Plant watering varies between plants. It is easy to plant a few shrubs and trees in the yard, they look great when they come from the nursery but how do we get them to grow, flower and look healthy at all times? We do live in the desert southwest and temperatures can range from the low 30’s some winter nights and over 110 degrees during hot summer days. With over half of the water use in your home possibly going to water your lawn and landscape it is important that you have somewhat of an understanding how much water your landscape needs to keep the plants healthy and at the same time keep your water bill under control! Here are some helpful hints to be sure your plants are getting the right amount of water. How can I tell if my plants are getting enough water? Small plants such as flowers, groundcovers and cacti should be watered to a depth of 1 ft.
Shrubs should be watered to a depth of 2 to 3 ft. depending on type and size. You may use a piece of rebar to drive into the ground to determine how moist the soil is around your plants. As long as the soil is damp, the rebar should easily penetrate the ground. How can I tell if my plants are getting to much water? Plants which are getting to much water will begin to turn a lighter green or even yellow. This is caused by the lack of oxygen in the soil. There should be no standing water around your plants within thirty minutes of watering. Eventually this will cause root rot and the plant will dry up quickly even if the leaves are still green. What are the signs I should look for to tell if I am watering my lawn properly? Summer lawns should be watered to a depth of 10 inches and winter lawns to a depth of 6 inches. You can test this by penetrating the lawn with a large screwdriver, push it down until it stops. Burmuda May – Aug. 3 times 8 min. 10 min. 12 – 15 min. How should my drip irrigation system be set up to water my plants and trees? With so many different soil conditions and plants available in the southwest it is critical that your drip irrigation system is set up properly for optimum control of how much water your plants receive each time you water. Separate irrigation zones should be set up to water your plants, trees, fruit trees, seasonal flowers, pots, vegetable garden or even a rose garden. You may also want separate zones if you wish to have a desert scene in your front yard and a tropical oasis in your back yard! How do I determine the number of drip emitters to install on each of my plants, trees, etc? Emitters are sized by the Gallons per hour (GPH), use the table below as a guide to help you. The table is based on number of emitters normally installed by professional landscape companies. The amount of time you set to water your plants will vary based on the amount of penetration you are getting due to the soil conditions in your area. If your plants and trees are set up to share water, additional adjustments will be necessary. Green ServPro LLC provides free estimates and consultations for Lawn, Landscape and Garden Care. We would be glad to assist you in your efforts to ensure your home maintains the curb appeal and outdoor living space we all want to enjoy. We would be glad to give you a free irrigation system analysis to determine if your system is set up properly for the optimum health of your plants and trees.